The Model 6100 Formation Response Tester (FRT) is designed to accurately measure the permeability changes of a formation sample when exposed to a variety of test fluids. This highly flexible, easy to use system is capable of simulating nearly any well completion and stimulation schedule on a core sample. The unit is also capable of operating as a dynamic fluid loss tester with the optional Slurry Cart. 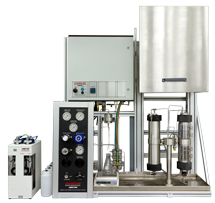 The unique design of the Model 6100 allows fluids to be injected through a prepared core sample to simulate the flow of treating fluids or formation fluids. Core flow can be directed through several paths: Injection and Production (forward, reverse), Top and Bottom flush (across-face) and Leak Off and Lift Off. Up to nine separate fluids can be controlled in any sequence through any flow path (6 directly connected to the pump and 3 accumulators). The system is designed to handle acids and other corrosive fluids at temperatures up to 350ºF / 177ºC. Reliability is designed into the Model 6100 to ensure many years of service. A custom valve manifold contains all necessary flow paths. This significantly reduces the number of fittings, the maze of tubing, the fluid dead volume, and most importantly the number of potential leaks. Durable, air-operated valves 316SS or C-276 wetted parts can be quickly and easily replaced if needed. programs or selects a flow schedule and a desired temperature before clicking on the “run” button to begin the test. Multiple pressure ports along the core allow monitoring the change in permeability as fluids invade deeper into the core as well as the determination of skin factors which may influence the testing results. The software for the Model 6100 also performs the data acquisition. All channels are recorded with time and can either be outputted directly or exported in spreadsheet format. The recorded data includes the measured and calculated values selected by the user. Upon test completion, an automated cleaning cycle can be run to prepare the system for the next test. Manufacturer’s specifications subject to change without notice.